Solr support many languages where user can indexing/searching their documents.In this article we will discuss how indexing/searching done in one of the most popular language in india which is also nation’s national language. Let’s look now how we can configure above filterfactories and use them. Create custom fieldType and add above FilterFactory as below. Now use above created field type in field defination. Add documents which has hindi content like “जावा डेवलपर ज़ोन बहुत अच्छे ब्लॉग लिखते हैं”. here we are using solr upload document command solr gui dashboard. 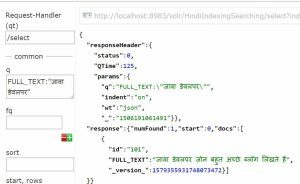 That’s it.To test whether particular document is indexed or not.Fire query like FULL_TEXT:”जावा डेवलपर”.Solr will return one document as below. Refer Language Analysis , Stemming , Configure stop words , Configure synonyms for more details.